We all know that guitar players and pianists play chords, but do bass guitar players use chords? YES--but in a different way! Since the bass guitar usually plays only one note at a time, the bass player usually plays chords in the same manner--one note at a time. Why is it important for you to know the same chords that the guitar player uses? Because bass guitar parts are primarily made up of notes in the chord that is being played by the rest of the band. Below, you will find a free chart of the Major Chords for the bass guitar. 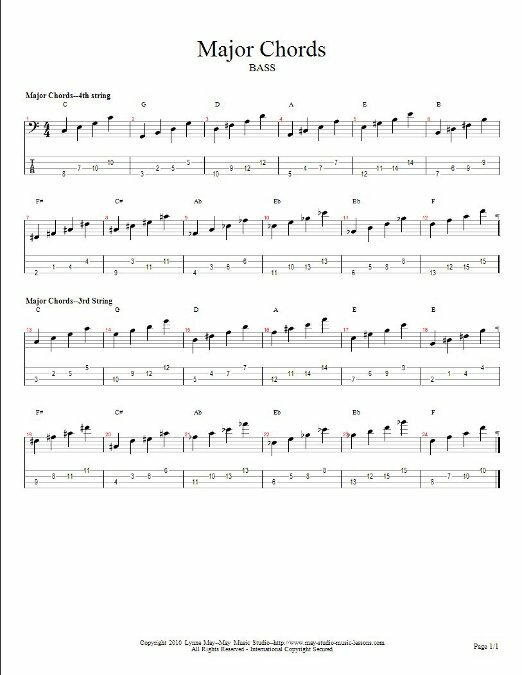 In case you don't yet read bass guitar notes, I have included easy to read tablature. Here is the chart. If you want to print it, just right click on the image, choose "save image as",save it to your desktop and then print it. ***You should MEMORIZE the chords. Notice that for each string, the pattern is the same for all chords. If you know the names of bass guitar notes, you can just memorize each of the two patterns and then start on the note that has the same name as the chord you want to play. ***You can practice these chords with a metronome. Just set the metronome for about 60 bpm to begin and play one note per beat through the entire series of chords on one string. Then you can gradually increase the metronome speed. Leave "Bass Guitar Chords" and Go to "Bass Guitar Minor Chords"